We had shared our views on China, much before the world and we saw the impact of it temporarily on India in terms of the stock market correction. A lot of our fellow Happionaires have been asking me what does the slowdown actually mean for India. Will this cause our economy to crash and will everything be in danger? The answer is very simple - we as Indians have always thrived whenever we have faced challenges and difficulties. From the beginning of time, our best comes out whenever we are faced with the worst. The Mughals and the British came to India, but instead of destroying us ensured we thrive. The best gardens in Delhi are because of the Mughals and we have more English speakers than the British. Our country was on the verge of bankruptcy and had money left for a few days in 1991 and that is what caused us to open the economy and we thrived. Today our companies and people are among the most respected and loved. 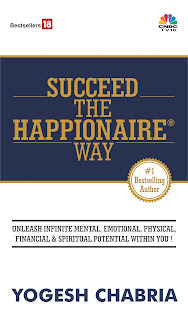 During the Crash of 2008, we had countless people reading and benefiting from Happionaire's Cash The Crash! It was the simplest and yet most powerful book that motivated people to look ahead and fight and benefit in the times of challenges. Today the world is facing a challenge with China's problems and India is also being affected, but we are very different from China. Our growth has largely been because of the innovation, intelligence and hard working nature of our people. Unlike the Chinese we have not received billions of dollars of subsidies, tax breaks and cheap money. In many ways we should thank the Indian Government for ensuring they have not done what the Chinese did. Because we didn't have billions of dollars in free money, we were more careful and cautious. Our money did not go towards building goods for the world and ensuring we sell it cheap. Today ever good we see is Made in China, because they subsidized their companies to buy for the world. There growth was not realistic and was like a runner running on steroids, instead of a runner who trained hard and built up his stamina. India will be the world best and biggest economy. because we have huge potential - we need to build thousands of kilometers of roads, we need to build new schools, universities, toilets, parks, health care centers, power plants, hotels, temples, mosques, churches, gurudwaras, movie halls and almost everything else imaginable. To do this we will need raw materials from bitumen and crude oil to cement and steel. We will need engineers, architects, designers, doctors, teachers, scientists, managers, marketers, advertisers, writers, entertainers, politicians, authors, leaders and people willing to offer their skills and their talent to build a nation that will become the world's greatest. Today if you are reading this more important than looking at investing in particular sectors is to simple look at what you can do best and go out there and build on it because there is immense opportunity and immense demand. Use your knowledge and skills and benefit from the times we are in. In addition to economic power we have the backing of a very strong spiritual back bone, we have the power of respecting all beliefs and thoughts - where we believe in One Divine Force and One Universal Power. As a nation I have immense faith and belief in India because of its wonderful people. Wherever we have gone in the world, we have ensured with us the people and country there grows - from UAE and the Middle East to UK, Canada, America and Australia and Africa. We have ensured that we have bought growth and prosperity while maintaining our own values and also respecting the values of the people there. I am proud to be an Indian and I am sure and confident about the wonderful nature of all of us! I want you to share this with everyone you know if you believe and agree with what I say to ensure every Indian reads this message. Yogesh ji............I have no words to say..it was simply beautiful and so true and inspirational.....will share it with every Indian I know! Indeed Rajesh - on Twitter there are some haters of India not agreeing with this - but they do not know the facts and the greatness of our nation! Keep it up and sharing such noble thoughts! Incredible insight Yogesh. I am equally confident that India will continue to thrive inspite of challenges.You have rightly mentioned that we have historical data to demonstrate that we have thrived inspite of so many deep challenges because of our culturals , values and togatherness strengths. Thanks so much for the lovely words and support. Indeed Pratyush our values, culture and history is what bind us together. Continue to thrive ,inspire and uplift as many soul as you.. Thanks Pratyush for the lovely suggestions and ideas. I would be happy to do these sort of talks and itnerviews through blab. I did check out the website and was wondering how it works? Would we need someone to ask the questions? Or should I just talks and do it online? Will look forward to your incredible insights and sharing he message with everyone out there! Lots of smiles and love! Thanks Pratyush and sounds like a great idea. We can surely do an interview and would be happy to have you take it. So would the regular laptop camera be good enough? Let me know what topic you have in mind and also the timing. Lots of respect and thanks for the lovely advice!